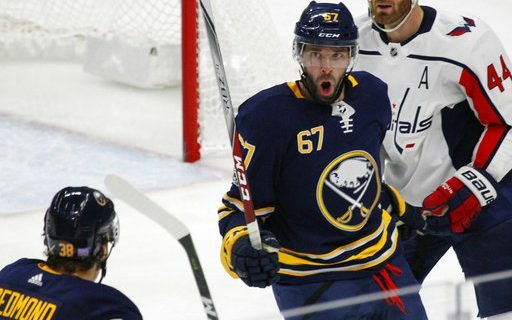 The Buffalo Sabres bent that just a little bit on Tuesday night. They played about 53 minutes in the KeyBank Center. Still, that was enough to pick up a 3-1 win over the Washington Capitals before 17,146. When you are looking up at the rest of the Eastern Conference, as the Sabres were when they were coming into the game, you’re looking for signs to be optimistic. Those were in evidence in a contest that won’t be hung in the nearest art gallery so that patrons can admire its beauty for decades to come. Start with the start, which featured a Sabre team that allowed the Capitals few signs of life in the early going. The shots were 15-4 in Buffalo’s favor, which felt about right. The 0-0 tie after 20 minutes did not feel right. It also helped that Evander Kane got the game’s first goal early in the second period, serving as something of a reward for the good work that came before it. Buffalo still looked in control after that, but a loud hit and brief fight seemed to change the momentum for a little while. Washington’s Tom Wilson pounded Sam Reinhart into the boards with a huge hit. Jake McCabe came over to Wilson, dropped the gloves, and exchanged some punches with a bigger man. That earned McCabe the appreciation of his teammates. Maybe so, but it seemed to give the Capitals a lift. Washington finally showed some signs of life for the rest of the second period. The Sabres also left Alexander Ovechkin open in the slot for a moment, and he knows what to do with the puck in such situations. Snap – No. 571 of his career, and a tie game. From there, it was a matter of seeing who would get the next goal. And Benoit Pouliot got it with a nice display of offensive skill. That seemed to extinguish most of the life for the Capitals, who were playing their second game in two nights. Washington had a couple of flurries the rest of the way, but the injury-riddled Sabres’ defense held on. Kane added an empty-netter, and that was that. The win moved the Sabres out of the basement in the East, passing Florida and Carolina. That doesn’t mean much. in early November, of course, but baby steps of progress are more than welcome for a team that has crawled forward and then sprinted backwards in the season’s first month. “When we play 60 minutes, we can beat anybody in the league,” Scandella said. “…. we want 54″…… ahh the good old days!!! Good Read Paul!